That�s an easy way to practise the elementary forms of passive -present and past simple passives. I used them to revise before a test. Hope you like it!!! 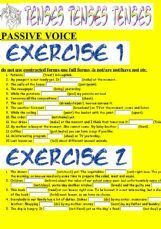 This material consists of 4 exercises and provides practice of Passive voice. 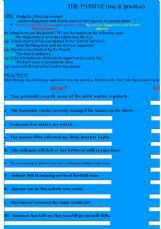 It�s an activity for students to revise the use of the passive in the present, past, future and present perfect. I hope you find it useful! Enjoy this exercise and improve your knowledge in passives. 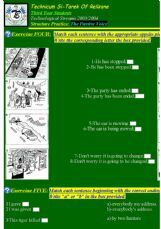 grammar test which can help young learners to practice simple passive. This activity is rather about the USE of the passive than the FORM. 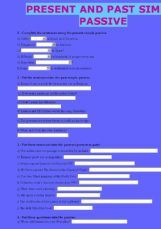 Comprehension(the pupils should find the appropriate question word) and Grammar (elaborating questions in the passive) Enjoy! Let�s learn the passive voice! 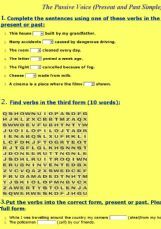 In this exercise Ss will choose the correct alternative, they have to complete with the correct form of the verb To Be in present simple, They have to complete sentences using passive voice in simple present and in the last ex. Ss have to choose the correct sentence. I hope it will be useul. Hugs rom Argentina, Claudia)))))))).